It is just possible to have a look at the European Saffron White Book elaborated by several institutions of Spain, Greece and Italy in the course of the Saffron project within the INTERREG III C programme. 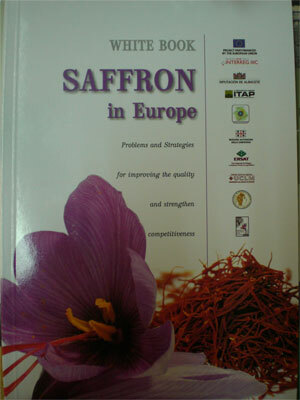 European Saffron White Book collects current information about the saffron sector and proposes an strategic plan to solve the actual problems. Demonstrative DVD "Saffron taste and aroma. Spectrophotometric measurements"
UCLM and ITAP have edited a demostrative DVD in three languages (English, Italian and Spanish) useful for performing practical courses and for dissemination activities. It demostrates in less than 25 minutes those parts that can be performed in any saffron SMEs: how to prepare samples, how to determine picrocronine an how to determine safranal by UV-Vis. - In San Gavino Monreale - XVII Saffron regional festival from 8th to 16th November 2007. - Turri - Saffron festival 10th-11th November 2007. - Villanovafranca - Saffron festival 10th-11th November 2007. Attached you can find the programme. Saffic partner Krokos participated in the chef seminars in Dubai. 3rd International Symposium on Safron. Forthcoming challenges in cultivation, research and economics. Traditional procedures of separation and driying of Castilla-La Mancha Saffron. 4th Edition of the Course "Ciencia en Vivo"
Organized by Faculty of Food and Tourism and other National and International Institutions.